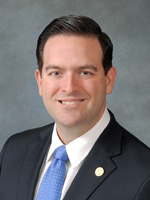 Jose Felix Diaz, who lives in Miami-Dade County, was elected to the Florida House of Representatives in 2010 and reelected subsequently. In 2017 he resigned to run for Florida state senate District 40 in a special election. Diaz is a lawyer.